Never miss another domain auction. With GoDaddy Investor, the app made for domain investors, you can register valuable pre-owned domain names with the world’s largest domain registrar anytime, anywhere. 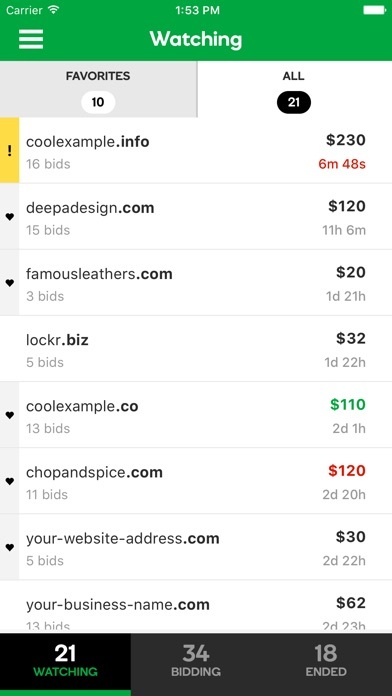 Watching and bidding on expired domains just got a whole lot easier. •	Monitor auctions in real time. 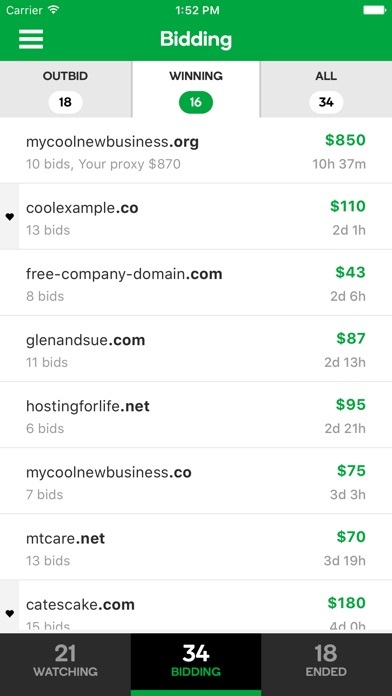 •	Bid on domains and know instantly if you’re the highest bidder or have been outbid. •	See the auction history for each domain, including the number of bidders and how much they’ve bid. •	Use your watch list to track auctions. •	Place proxy bids. •	Approve a bid with your fingerprint. •	Get notified before auctions end, whether you are watching or bidding. Find out instantly when you’ve been outbid so you can move on quickly. •	Use GoDaddy’s domain appraisal values — the most accurate and comprehensive pricing estimates — to help drive your buying and selling decisions. Yes u can bid on auctions and perhaps even get an alert, but only if the app feels like it. Pay attn Godaddy devs (I already emailed this to Deron): 1. The app used to log u out randomly forcing u to reauthenticate, which means u miss auction alerts because u never know when ur logged in or out. 2. The app now logs u out daily at random times, which means u have to reauthenticate daily or first thing every morning. 3. The app doesn’t tell u when ul be logged out, so it’s a surprise. Seriously - who the hell wants to reauthenticate daily, weekly, etc? I use 2 factor authentication, so it just compounds the problem. The app issues have now forced me back to a monitor because it’s essentially useless now. Terrible app, not user friendly or helpful at all. You can’t find listings on this app, nor can you sell owned domains. Pretty much a useless app with nothing but blank screens. It doesn’t deserve the 1 star I have given it. 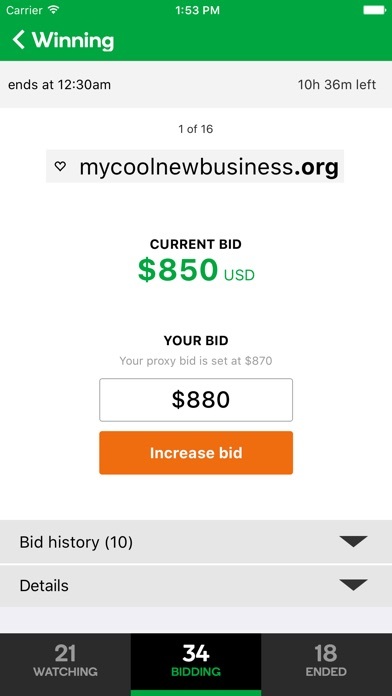 I downloaded because I was tired of the vague, difficult to use website for auctions, thinking maybe the app would be a more phone friendly way to buy and sell domains. You’d think a company that specifically sells domain services would at least be able to make a decent website/app themselves. Every time I submit a bid, the app closes. So frustrating. Please fix because otherwise it’s a great app! So today I noticed there was an auction for a domain name that I needed, not a prospector, it’s a domain name that I’ve been wanting for years. So I signed up with GoDaddy auctions, paid the fee and downloaded this app to my new iPhone and my new iPad. I did a test bid to make sure everything worked properly. When the auction go down to three minutes I tried to submit a significantly higher bid than what was in there currently. The app was unresponsive and then would close to home screen, the way a lot of apps did back in 2009. For three minutes I tried to submit a bid with perfect Internet on my iPad and iPhone and it kept dropping to the home screen and closing the app on both devices. In fact the last five minutes of the auction no one was able to place a bid at all. I asked someone else who had made contact about that domain name and was also bidding on it, and they said they were unable to place any bids as well. 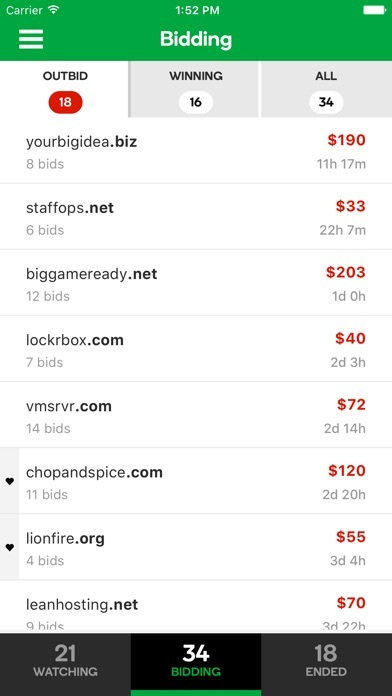 There was only six people total involved in the auction, it’s not like there were thousands of people making a mad dash for it like when Apple releases a new product. I called customer support and they say there’s nothing they will do. So basically now I’m going to be stuck having to buy this domain name for thousands of dollars from whatever prospector picked it up. I never should’ve relied on a GoDaddy product. After spending over hour to get it to work, I surrender. It’s useless, and I’m really surprised GD would put something live that is lousy. An hour of my life .... wasted. I downloaded this app 3 times to be able to watch my bids, I have daddy acct but for some reason every time I open the app it’s just blank. I end up just opening the regular godaddy app on my mobile to attempt to view all.